Opening Ceremonies for the 2018 Winter Olympics are just around the corner, but for the first time since the late 90’s, NHL players won’t be there. The league announced last spring that it would ban its players from participating in the Olympic games this year, citing a number of reasons including increasing costs and disruption to the NHL season. 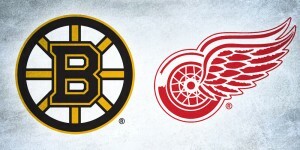 With or without the NHL, the games must go on, and while you might not recognize a good chunk of the names on the US and Canada rosters, indeed they will. 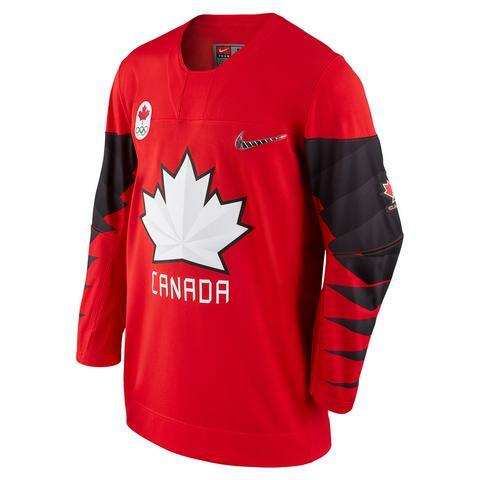 Nike announced the set of Olympic jerseys back in November, but now that the games are approaching, goaltenders are starting to share their masks for PyeongChang. Let’s take a look at the masks we’ve seen so far––keep checking back as more are revealed and we continue to break them down! The first of team Canada’s masks for PyeongChang belongs to former New York Islander, Kevin Poulin. 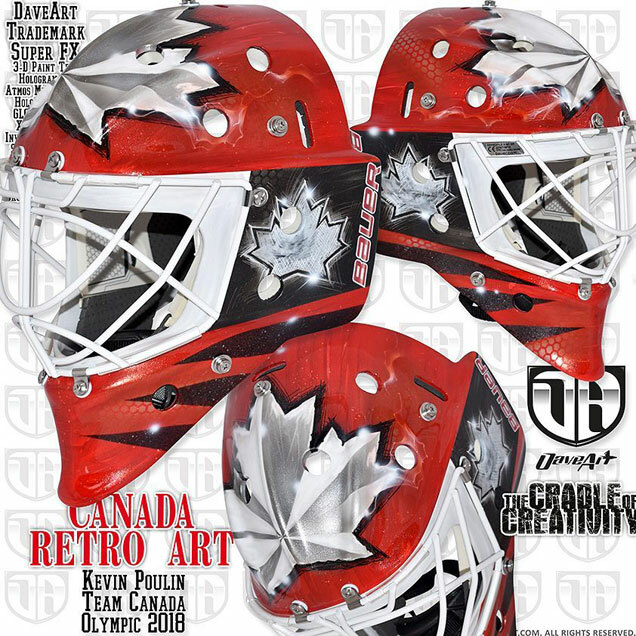 Painted by David Leroux, Poulin’s mask plays with texture between the matte white background and glossy red maple leaves. Leroux is known for this crisp, flawlessly-executed style, and this design is certainly no exception. The bold composition from afar is packed with fine detail, including a pinwheel pattern and the word “Canada” subtly stenciled within the leaves and sketch pen shading in the negative space. 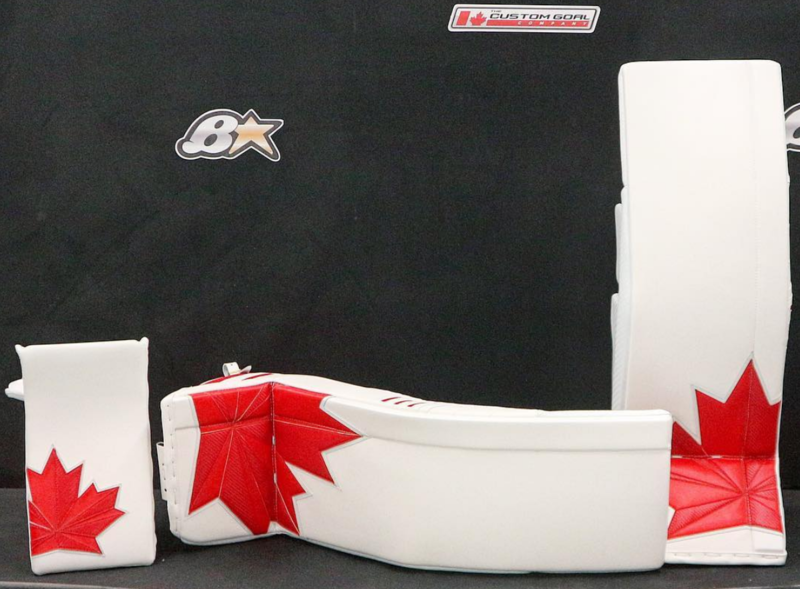 Poulin also has a killer set of Olympic pads to compliment the graphic style of his mask, so we’ll see if the gear brings the Canadian netminder any luck in PyeongChang. 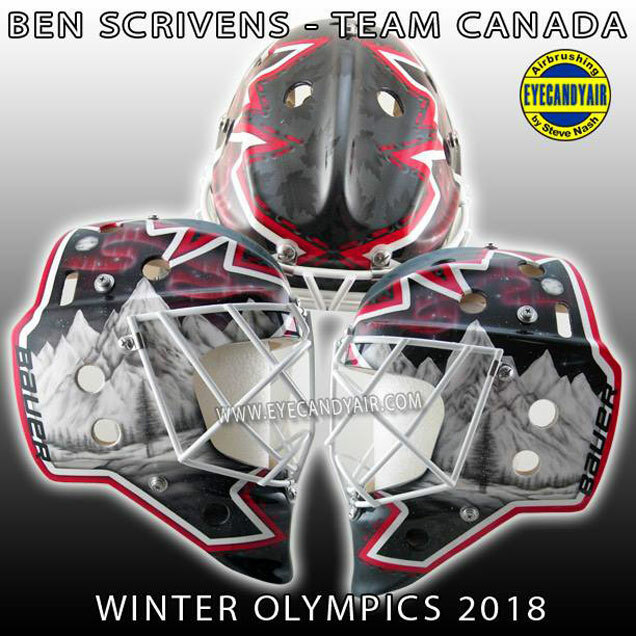 Poulin’s teammate in net for team Canada, former Leaf, King, Oiler and Canadien Ben Scrivens, also has a new bucket for the Olympic games. Painted by Scrivens’ regular artist, Steve Nash, the design features beautiful mountain landscapes framed within the silhouette of the Canadian maple leaf. Nash kept the design fairly monochromatic, using black and gray for the mountains with pops of red only in the leaf outlines and Northern Lights. 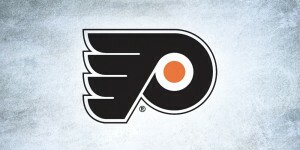 The negative space is populated with faint black-on-black leaf silhouettes, giving some extra visual interest to the generally simple composition. The leaf borders also have a subtle stitching detail around them, which adds yet another dimension to the thoughtful mixing of styles in this design. The blending of graphic and realistic styles in this design works really well and helps create a legible and balanced composition. 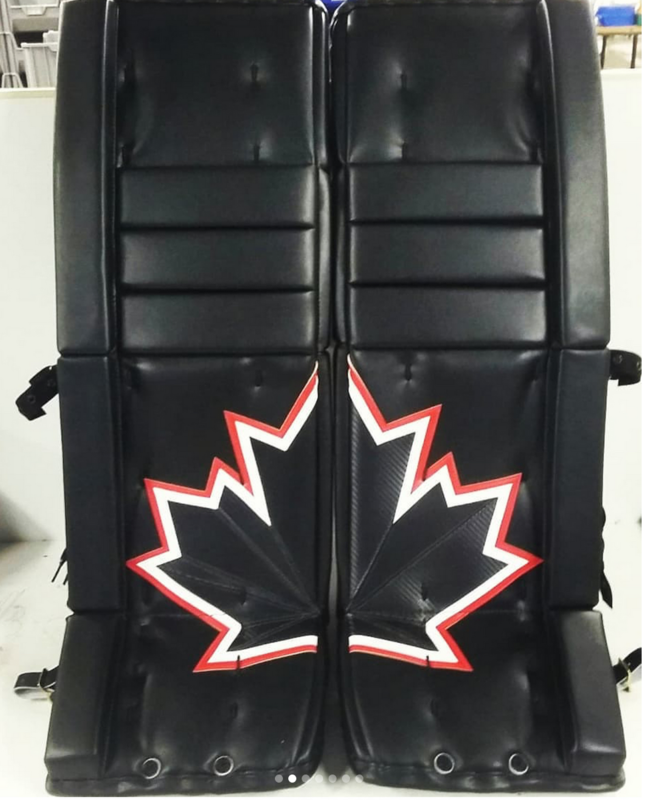 Scrivens also has a slick set of new pads for the Olympics, so we’ll be looking forward to seeing the pieces come together on the ice in PyeongChang! 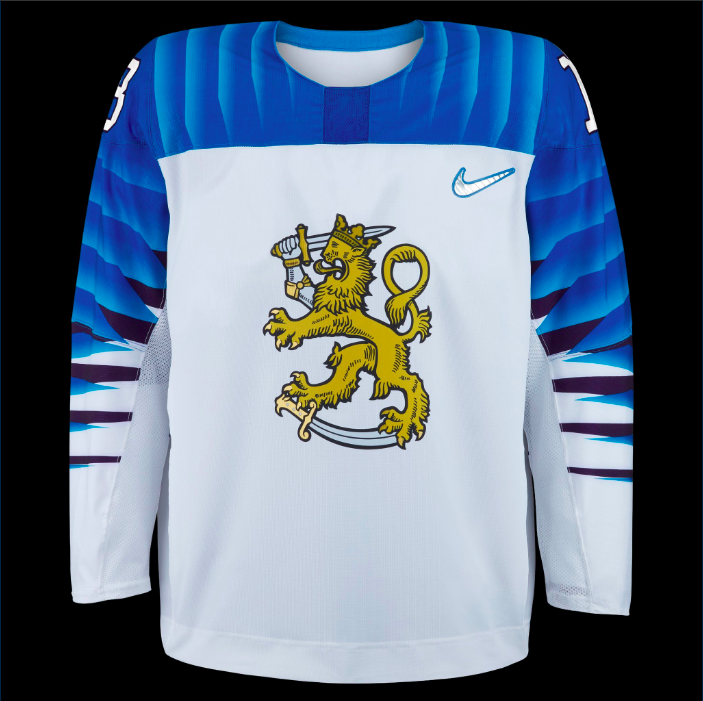 The blue pattern from the jersey sleeves and shoulders translates nicely into a negative space pattern on this mask with the white ribbons flowing in the foreground, creating the image of the Finnish flag. In true Daveart fashion, the mask is full of special effects, but the gracefulness and simplicity of the composition were a nice choice for the Olympics. 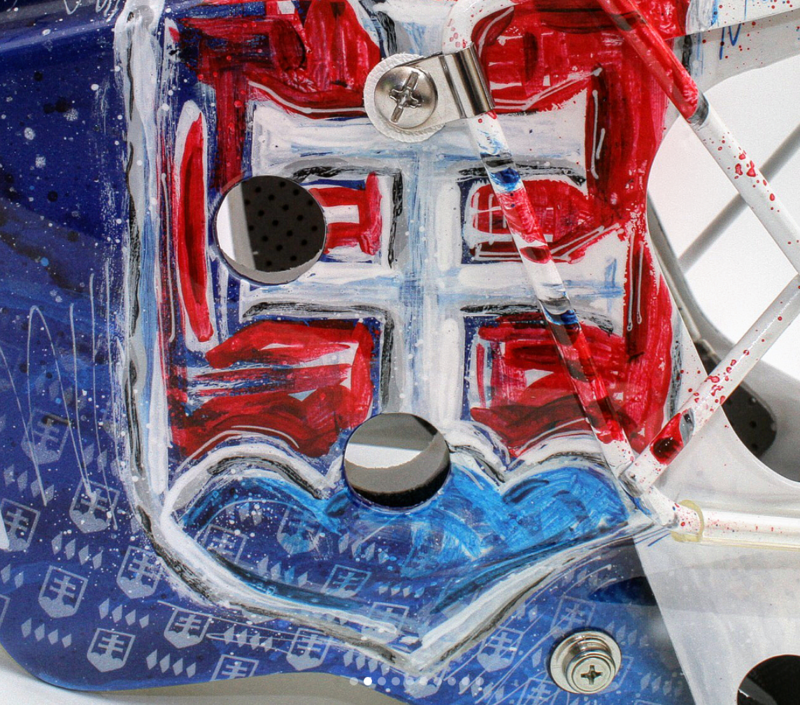 Painting masks for all three Norwegian goaltenders is Norway-based artist, Dennis Haanshuus. The first of the three to be fully unveiled is Henrik Holm’s, a mask that gives us a sort of Lundqvist-vibe (maybe it’s a Henrik thing). 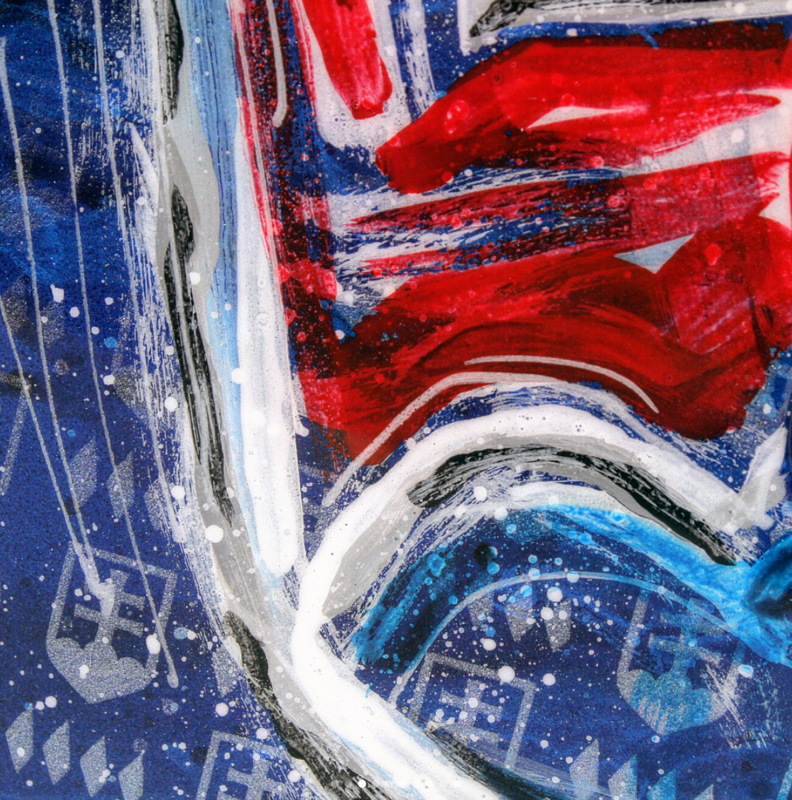 The predominantly blue composition has two main design elements––the Norwegian flag wrapped around the chin behind Holm’s number 38 and “Norge” stenciled in strong red lettering across the top. The negative space is populated with subtle landscapes and animal silhouettes, adding another dimension to the design. 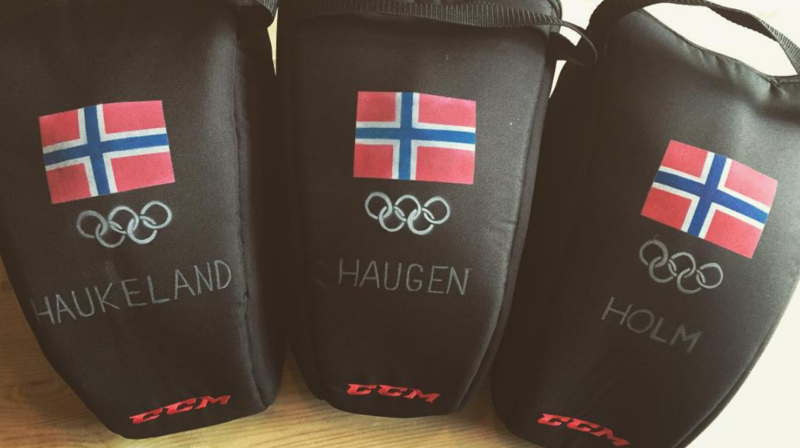 Haanshuus’ masks for Holm’s teammates, Henrik Haukeland and Lars Haugen, have been teased on the artist’s Instagram page, so we’ll keep an eye out for full views in the coming weeks. After the Olympics, Holm also plans to auction off the mask to raise money for a local pediatric hospital, although the details of the auction are still to be announced. 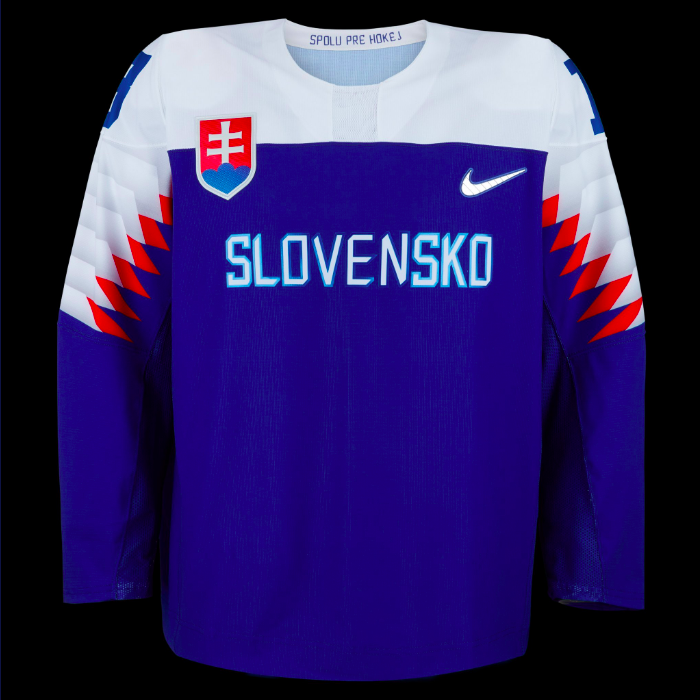 Perhaps more so than any other Olympic mask we’ve seen to date, Slovakian goaltender Patrik Rybár’s mask pulls inspiration from Nike’s jerseys for the games. 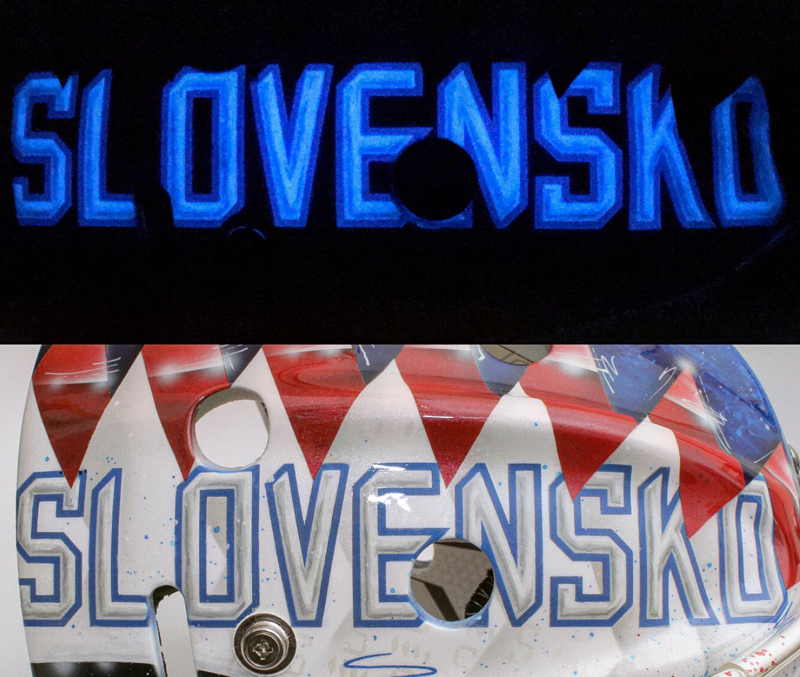 Painted by Peter Wolf, Rybár’s bucket mimics the diamond pattern from the jersey sleeves and features the same typography and Slovak shield. With some Daveart-esque effects including tiled holographic logos and glow-in-the-dark paint, Wolf’s painterly brush strokes really bring this mask to life and give it a dynamic look. The splatters creeping onto the white cage is also a nice touch, so just all around a well thought out and executed design for Rybár. The PyeongChang games will be an extra special experience for Canadian-born South Korean goaltender, Matt Dalton. 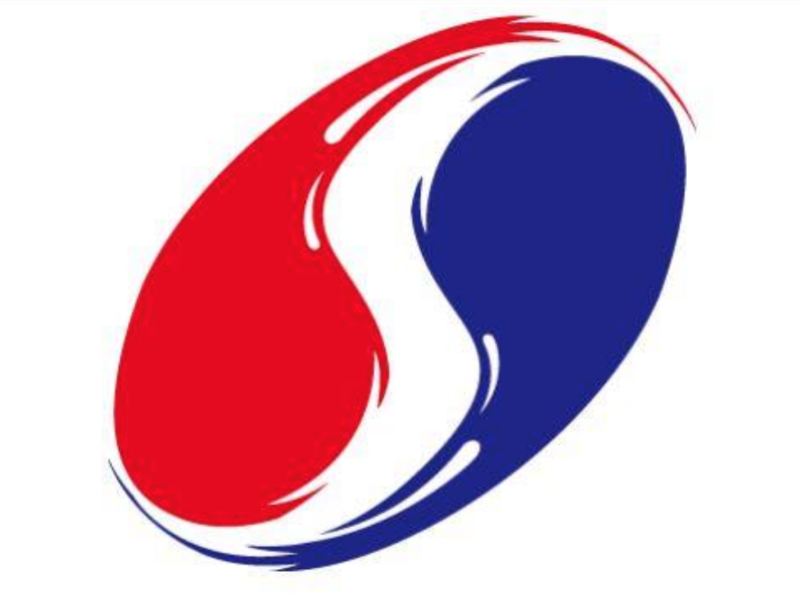 Originally painted by Sylvie Marsolais for the Channel One Cup, the design is based off a vintage Korean logo and features traditional illustrations, including one depicting Korean naval commander, Admiral Yi Sun-shin on the left side. The back plate further honors South Korea, where Dalton became a naturalized citizen in 2016, with an image of the country’s flag. 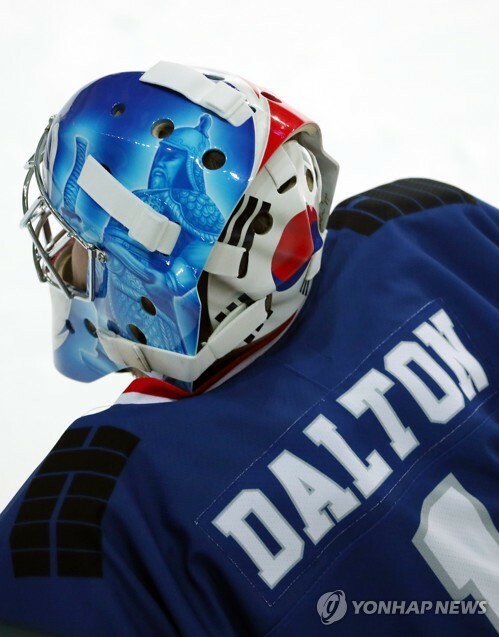 What Dalton’s mask will look like when he arrives in PyeongChang is still unknown, but we can still appreciate the original artistry by Marsolais while we keep our eyes peeled for the coverup. 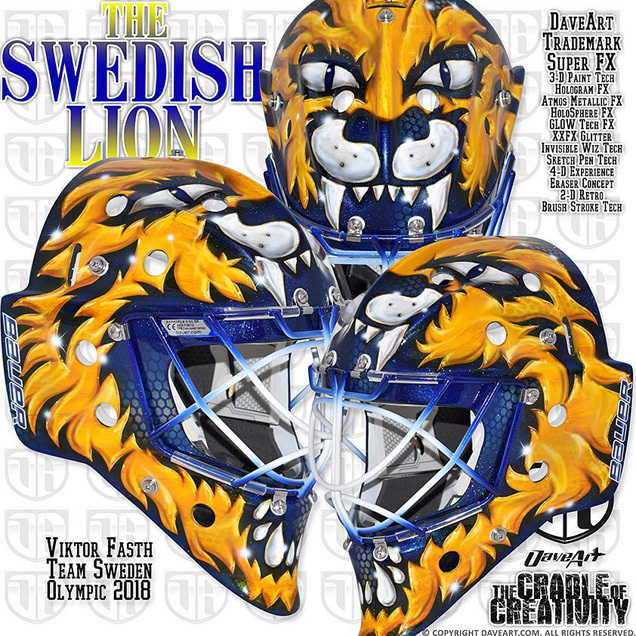 Titled “The Swedish Lion,” Viktor Fasth’s mask for the Olympic games fully transforms the goaltender into a blue and yellow lion. 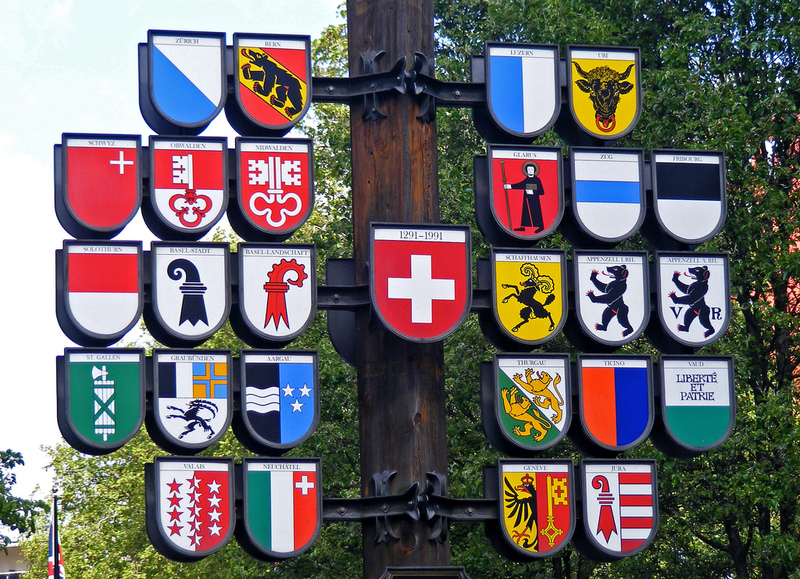 “The lion is because he is born in the star sign of the lion, and it is also a lion in the shield of Småland where he lives now,” Dave Gunnarsson shared of the concept. The design features many of Gunnarsson’s usual tricks like the gradient lacquer cage, holographic patterns and light flares, but the traditional composition makes it fitting for a historic event like the Olympic games. 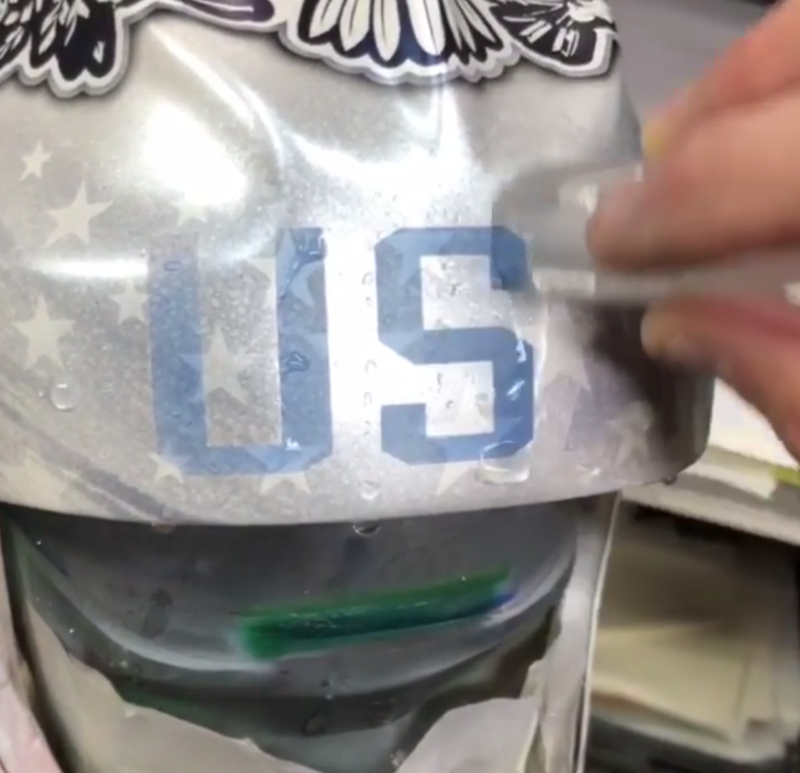 “The lion is created in a very old school way, but also with a modern touch so we loaded it with a lot of 3-D FX.” The blend of old and new come together nicely in this piece, which will be a standout mask in PyeongChang. 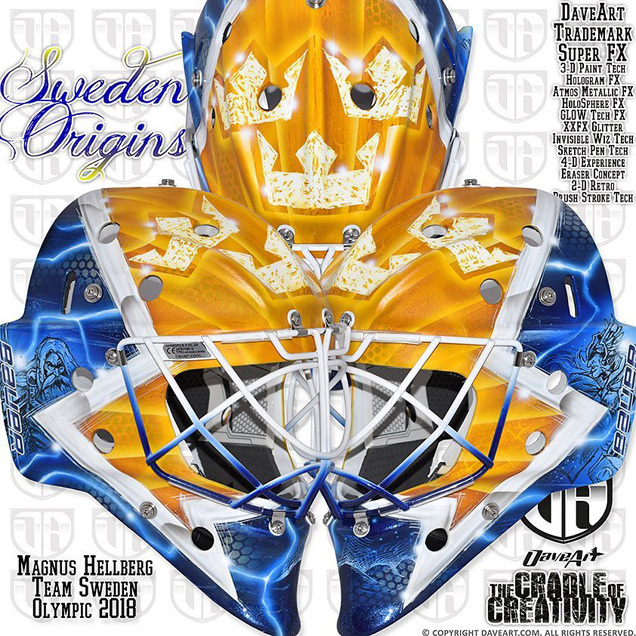 Gunnarsson incorporated the vikings on either sick of the mask behind the bold yellow Swedish crown, and the Viking Hills from Hellberg’s hometown are subtly sketched in on the chin. 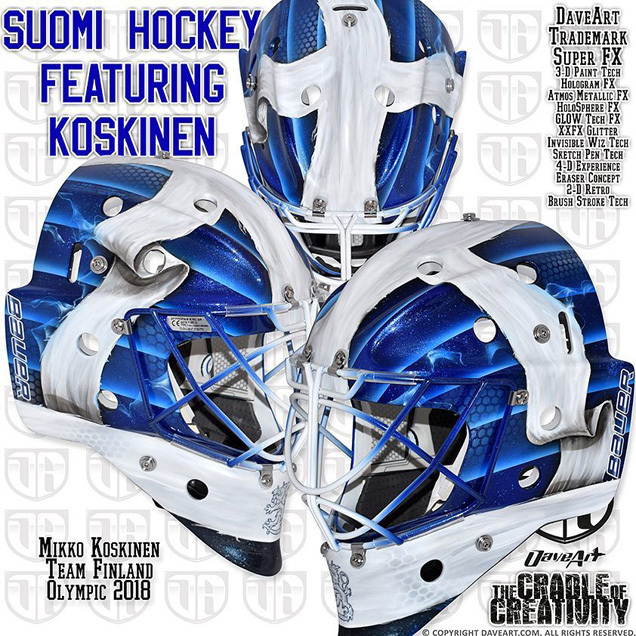 The Tre Cronor motif is repeated on the top of the mask, finishing off the Swedish tribute. We’ve seen Gunnarsson do masks like this before, most notably for Henrik Lundqvist, but the artist seems to be in a rhythm with crafting masks for his fellow Swedes that work for international play. Once sporting some of my favorite masks in the NHL, the now Swiss National League goaltender has a somewhat uncharacteristic look for his Olympic mask. 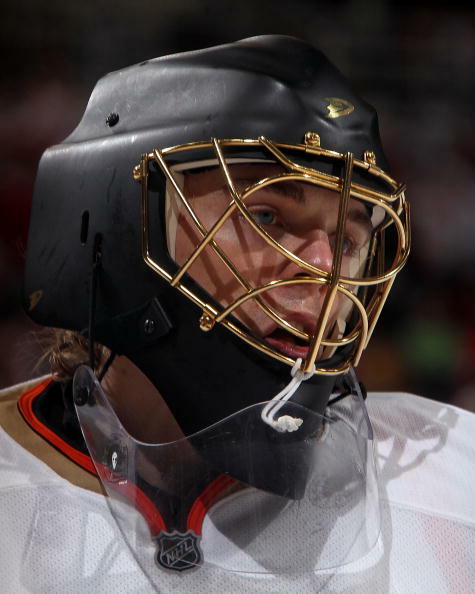 Over the years, Hiller became known for his slick and graphic mask designs by Swiss artist Alec Voggel, including the polarizing “Darth Hiller” bucket, Movember design, and 2010 Vancouver Olympic mask. 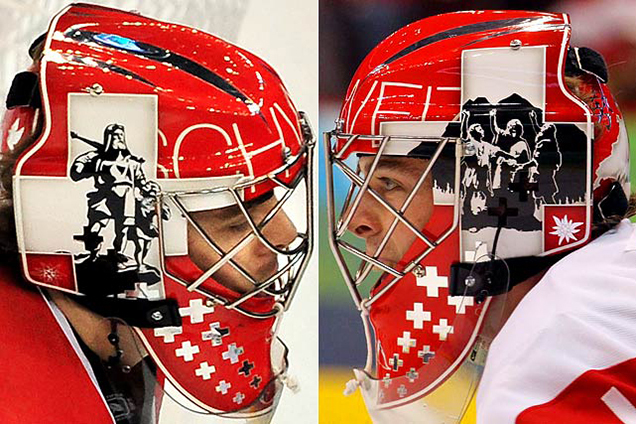 Hiller’s mask for the PyeongChang games swings in the complete opposite direction, using a busy camouflage-like pattern in the background with shields of the 26 cantons of Switzerland scattered throughout. Unfortunately, this design lacks the graphic power of the masks we’re accustomed to seeing from Hiller, and the composition just falls a little short. The presumed starting goaltender for team USA is former Mercyhurst netminder, Ryan Zapolski. 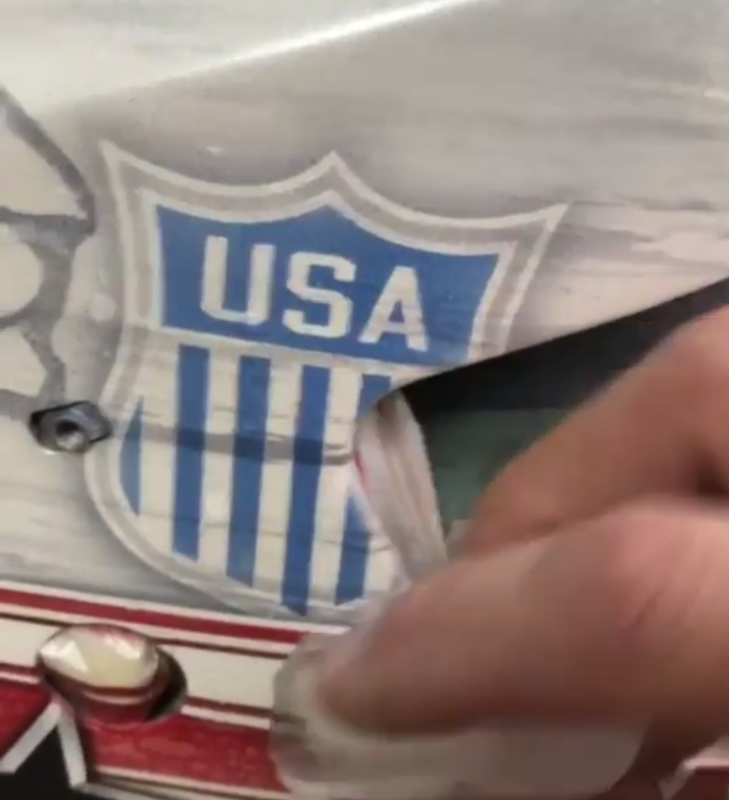 Also working with Dave Gunnarsson to craft his Olympic mask, the patriotic concept showcases the team USA shield in a bold, flag-inspired design. 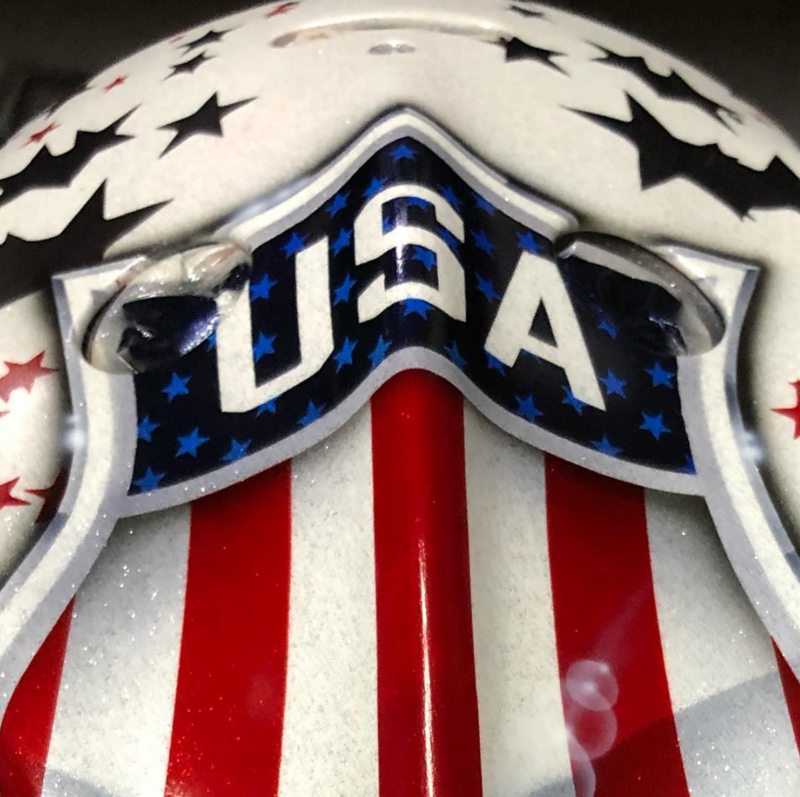 “I always try to add something from my past on my helmets so, of course, I will try to include something from Mercyhurst and Erie on my mask for the Olympics,” Zapolski shared. 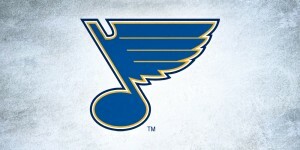 His alma mater reported that the goaltender wanted the Mercyhurst hockey logo and the City of Erie seal included in the design, so if permitted by the Olympic committee, we’ll see how Gunnarsson incorporated Zapolski’s requests into the mask. 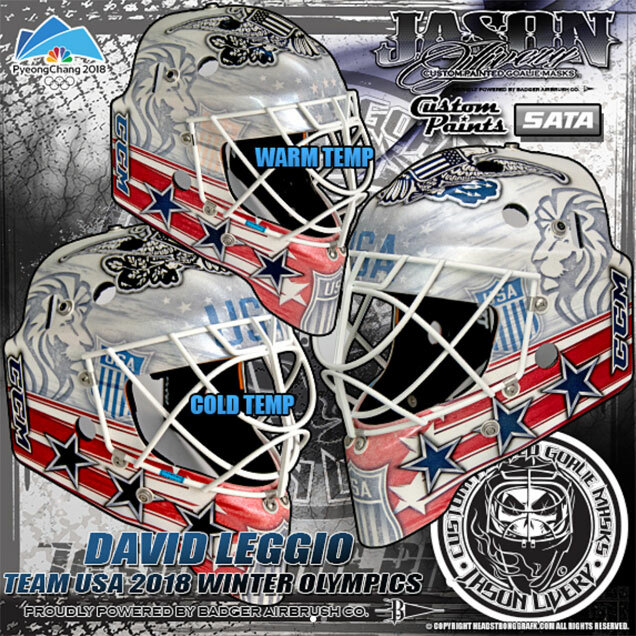 Zapolski’s teammate and former Clarkson and AHL goaltender David Leggio also has a star-spangled new mask for the Olympic games. Painted by Jason Livery, the red, white and blue bucket features color-changing technology that’s a bit outside the box. “I like to come up with different ideas and different quirks and things that aren’t the norm,” Livery told WJHC News in Florida. At temperatures below 70º, the clear pigment shows its color, revealing “USA” across the front and the shields on the sides. 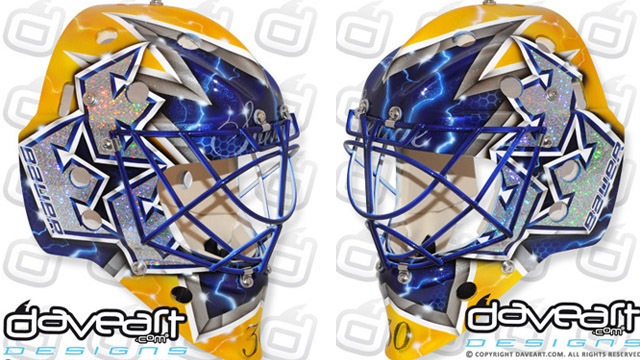 The mask also includes an illustration of a lion on each side, a request from the goaltender to represent his son, Leo. 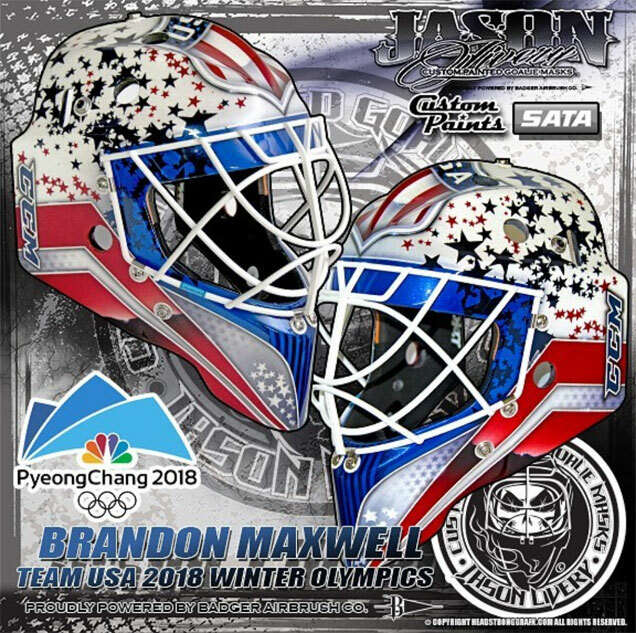 Rounding out the USA goaltending trio, Livery also created a mask for Brandon Maxwell that was first teased on the artist’s Instagram page. Maxwell’s mask was designed to match his new pads for the Olympics, and Livery did a great job of coordinating the design elements. 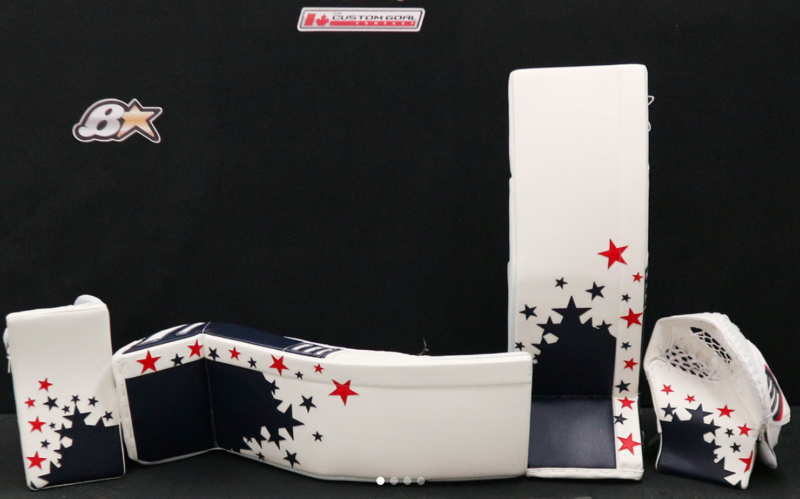 The clustered star motif carries over onto the top of the bucket, as do the angled red striping from the sides of the pads. 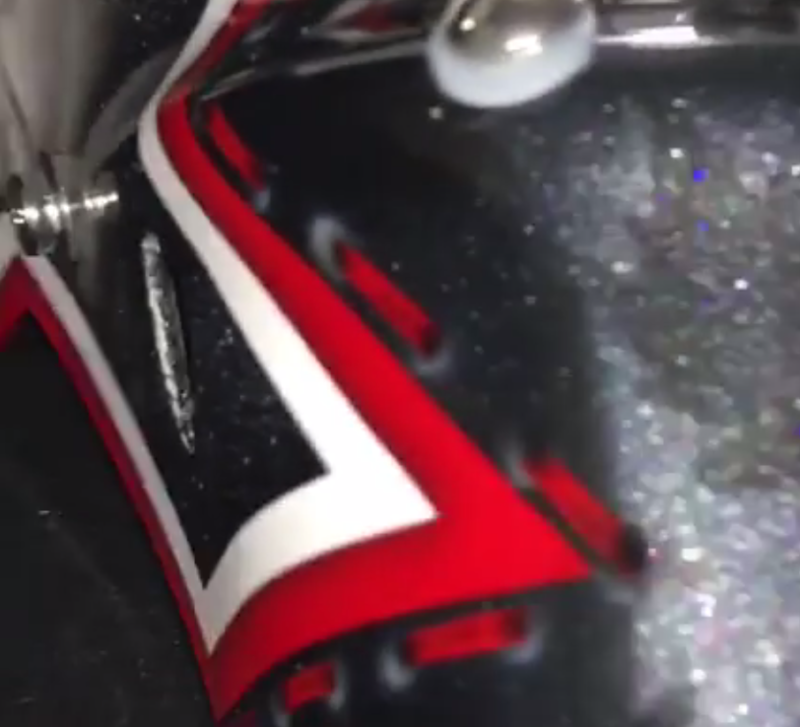 The centerpiece of the mask is the USA shield on top, which also appears on Maxwell’s glove for PyeongChang, so a job well done by Livery in considering the full set of gear when painting this design. 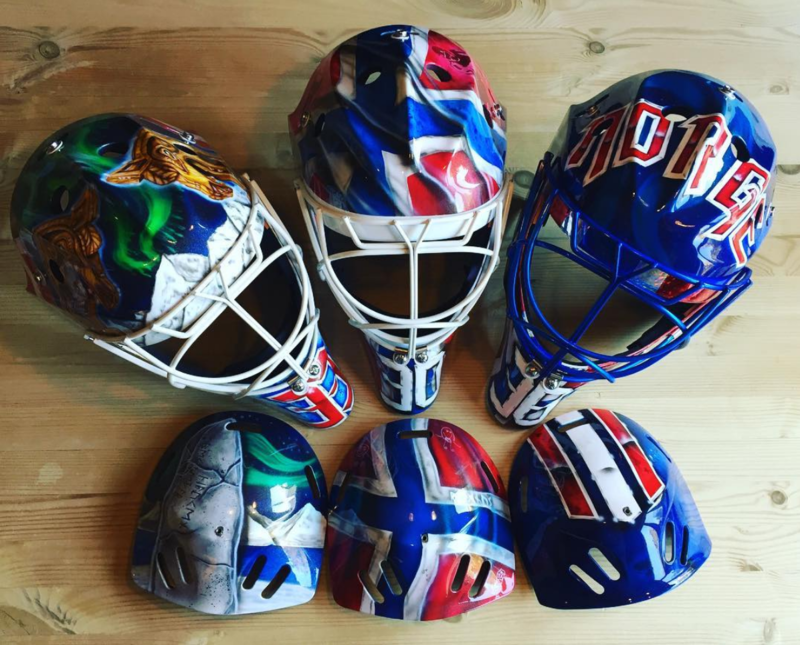 Which Olympic Mask is your favorite so far? Let us know in the comments, or on Twitter or Facebook!